Shotover River near Queenstown, NZ. White water rafting down Shotover River. Smiles all around after white water rafting. Megan Blandford – and her intrepid three-year-old daughter – set off on a rapid, family-friendly adventure in the adrenalin capital of New Zealand. Queenstown is the home of family-friendly adventures. There, the attitude is to keep doing what you love even after you’re a parent, and the kids can come along for the ride. So, as a keen adventurer and a mum, this was always going to be a place I liked – especially upon discovering the experiences on offer. Family Adventures takes families out to the famous Shotover River for some fun on the rapids, including kids from the age of three – the exact age of my daughter, Abbey. So along with my husband, we set off from the centre of Queenstown in search of some thrills, and hopefully not too many spills. The drive to the river is an experience in itself. The minibus negotiates the winding, narrow, rough dirt road through Skippers Canyon confidently, yet there’s a sense that anything could happen. After all, this is known as New Zealand’s most dangerous road, and you wouldn’t want to drive it yourself as car insurance companies completely wipe their hands of you along here. The guides talk us through the area’s history during the 45-minute trip, I suspect to distract us as we drive dangerously close to the cliff’s 100-metre sheer drop. I smile and laugh at their jokes, all the while trying not to look down. When we arrive, we’re ushered into a hut for an energy snack and to change into the rafting gear provided. As it turns out there’s nothing in the world cuter than a three-year-old kitted out for white-water rafting. This might be another ploy to distract us from the fact we’re wearing a couple of waterproof layers including wetsuit booties – a sure indication that the Shotover River is going to be a little on the chilly side. Our guides are terrific at explaining the whole process to Abbey and making her feel comfortable. As we walk over to the bright aqua water of the Shotover, paddles in hand, they chat to her and make her laugh, and as we climb into the raft they’re explaining what will happen. We’re given a little paddling lesson and then we’re off. Floating down the river, we see rusted machinery from the Shotover’s 1860s gold-mining past. As I ponder the rush of discovering gold, I am suddenly hit with a rush of another nature: white water ahead. “Paddle!” comes the call. We swing into action as the water bubbles like a spa bath in a rage, and the rapids bounce us between rocks. We’re through, and we smile with the sense of achievement. Well, all except one. Abbey is looking a little nervous. I ask for her thoughts and she says uncertainly, “It’s, um, okay”. I worry that this might have been too much for her first foray into adventure. But by the next rapid she’s smiling as the experience becomes more familiar. Soon my little daredevil is up the front of the raft with water splashing her face, squealing with delight. New experiences can go either way with kids, so it’s a relief that she’s enjoying it. Back on land, we dry off and laugh at the shared experience. Then it’s time for the drive back… Abbey loves it; I spend the entire journey trying not to look down again. Rafting tours operate twice a day and costs $166 per adult and $111 per child. 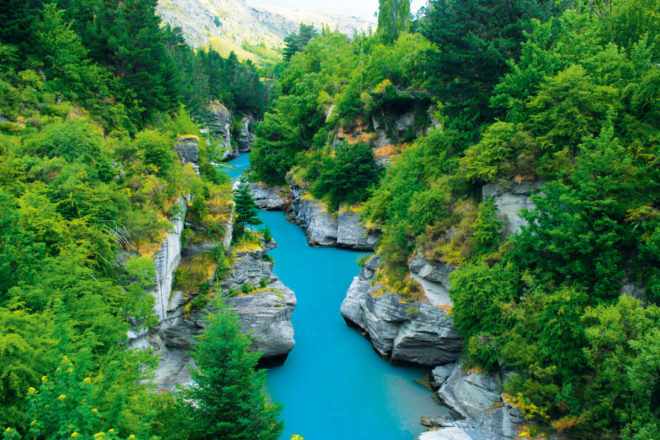 Try to come in the height of summer to take the sting off the cold Shotover River.